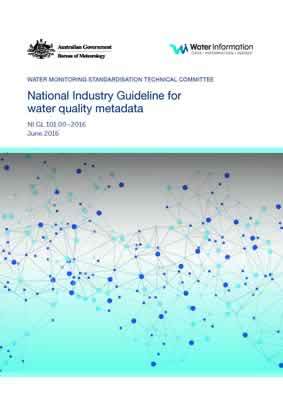 This document identifies the essential metadata requirements for water quality data to provide the necessary information to allow users to identify if data is fit for their purposes. Meteorology (the Bureau) under the Water Regulations 2008 by persons named in the regulations. It pertains solely to water quality data parameters being collected from surface water and groundwater as identified in the Water Regulations. It provides guidance about mandatory and optional metadata elements, and describes data entities (or groupings) that are meaningful and pragmatic for hydrographical, laboratory and hydrologic practitioners at a national level. The guideline is applicable to automated continuous water quality monitoring (e.g. using in-situ sensors or probes), tests performed in the field and grab samples sent for laboratory testing. While adherence is voluntary, implementation of the guideline will facilitate consistent collection of water quality metadata, and will improve the interoperability, quality and future usefulness of water quality data.